How a BoingBoing editor created a "New York Times Torture Euphemism Generator"
Hitting the refresh button repeatedly, one can view dozens of other absurd headlines. The absurdity is the point, Rob Beschizza told me in a phone conversation. Beschizza is the managing editor at BoingBoing, and the above headlines are the result of his “New York Times Torture Euphemism Generator!” which was posted to the popular blog late Friday night. 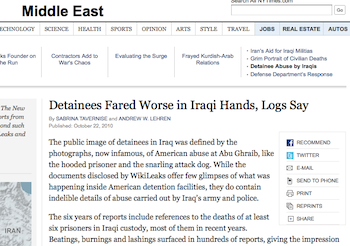 It includes an image of an article on the New York Times website with an interchangeable headline that provides a phrase meant to act as a stand-in for what many journalists consider a politically charged word: “Torture.” In the few days since being posted it has received over 460,000 page views.